Before flying to Hong Kong and ShenZhen, I was flying my new kite with my retiree friend after being dissappointed by the weak wind in Jurong Central Park (Safra) , two days ago. We cycled all the way from old Jurong West to West Coast Park, which took us almost 1 hour. "i like your tiger kite..." when i was busy attaching up my LED lights circuit to my tiger kite. we stopped at a hawker centre opposite West Coast Plaza (previously known as Ginza Plaza). 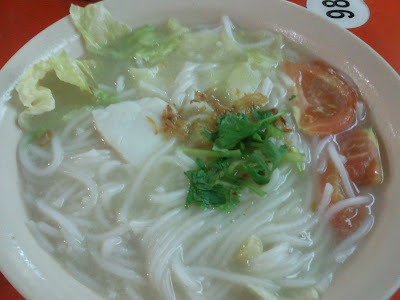 I ordered a bowl of Fish Sliced Bee Hoon at only S$4.00/=, while my partner reluctantly took S$4.50 Fish Sliced Soup with rice. 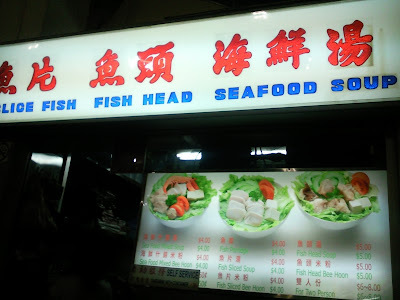 Really worth my money $$$, yummy and this is the first time i see a fishfood stall with Grade A in Singapore. Very clean and taste good! Soup is hot and Sedap! I wil give the stall 5 Stars rating!!! How to detremine wind speed for the day? Skip reading & scroll right to the botttom of this page. esp after a kite flying and cycling session. just click on the location in the given list below. eg. sengkang field. as forcast updates daily and get more accurate when the date draws closer. time is in 24hr, and the interval jump. for a nice gental wind look out for 3-4knots, those are the wind speed most kite need to get going. wind direction: basiclly pointing towards the direction the air if flowing. but i doesnt really matter when planning for location. as the wind does change on site. preciptation: arrr!! this is the one... u wont want to get wet. 1means drizzle.. 2 or more.. stay way XD.